LAKELAND, FL (August 27, 2018) – From August 25, 2018, 10:00 AM, through September 21, 2018, 6:00 PM, Fields Auto Group, Fields Motorcars (Mercedes), Fields BMW Lakeland - and the Suncoast Credit Union SwantoberFest team up for a special test drive promotion! 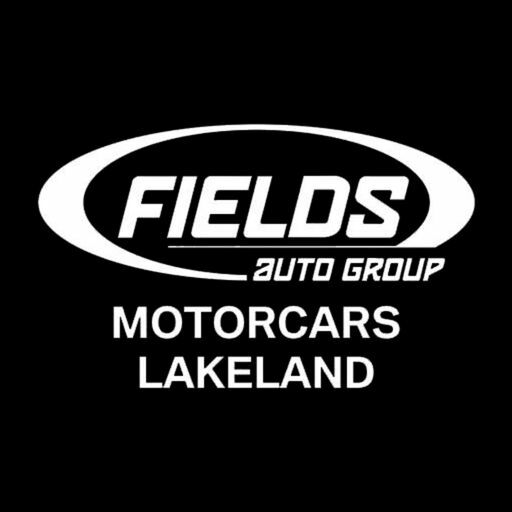 The first 100 people to visit and test drive a vehicle at Fields Motorcars (Mercedes) at 4141 N Florida Ave, AND, the first 100 people to visit and test drive a vehicle at Fields BMW Lakeland at 4285 Lakeland Park Dr, will receive a complimentary ‘Fest VOUCHER, and will be entered to win a Sweepstakes GRAND PRIZE! 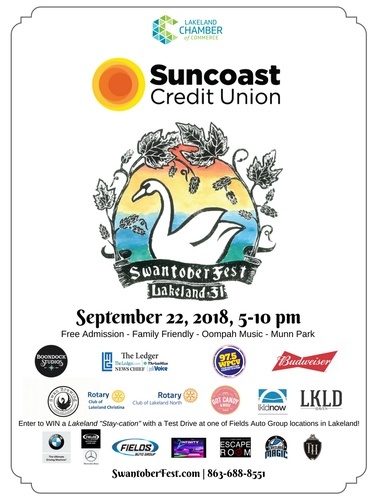 “We at the Fields Auto Group are delighted to partner with Suncoast Credit Union and the Lakeland Chamber for the inaugural Suncoast Credit Union SwantoberFest. Our selection of Mercedes and BMW vehicles are a perfect complement to the German theme. We hope that folks will take advantage of this promotion and we are ready! We are excited to showcase some of our Mercedes and BMW vehicles at the event at the Fields Auto Group Autobahn on Tennessee Avenue,” says Ron Bigler, Fields Auto Group. The test drive promotion launches this Saturday and will help to promote the inaugural Suncoast Credit Union SwantoberFest being held on Saturday, September 22, 2018, from 5:00 PM to 10:00 PM at Munn Park. The winner of the grand prize will be announced at the event from the Main Stage. Chef’s Table for Two at The Terrace Grille, two (2) front row tickets to a Lakeland Magic game, two (2) passes to a Florida Tropics Soccer Club game, two (2) passes to the Lakeland Escape Room, and two (2) passes to 2Infinity Entertainment Center. 2 Beers (or beverage of your choice) & 2 Official Commemorative Steins (acrylic). Please bring your Voucher to the Suncoast Credit Union SwantoberFest at Munn Park in Lakeland, Florida, on September 22, 2018, from 5:00 PM EST to 8:00 PM EST to pick up your Steins and Beverage tickets. For complete details, rules, terms and conditions, visit https://www.swantoberfest.com/fields. Food Sponsors: Pepperidge Farm, Incorporated and Publix Super Markets, Inc. The Lakeland Chamber is proud to announce Suncoast Credit Union as the title sponsor of Lakeland’s only Oktoberfest-themed celebration! Like a traditional Oktoberfest, our event will offer sights, sounds, and tastes that are Bavarian-inspired. Lakeland residents will have a chance to celebrate Octoberfest-style in Munn Park in downtown Lakeland on Saturday, September 22, 2018. The Suncoast Credit Union SwantoberFest is a time to unwind and make new friends, learn new customs and sing a few songs. Be there to help tap the inaugural keg at 5:00 PM on Saturday, September 22, as Lakeland’s Suncoast Credit Union SwantoberFest kicks off! This community-wide event in Munn Park will be free to attend and feature a business expo as an opportunity for Chamber member-investors to engage directly with the community in a family-friendly setting. Activities include German-style competitions, treasure hunt, and live music by The Europa Band. VIP passes will be available for an extra-special experience, including a Child’s VIP pass – think Root Beer Garden! To register as vendor-exhibitor at the event, please click here or at https://bit.ly/2JlSL0m. To learn more about the event, visit the website at SwantoberFest.com. The Lakeland Chamber of Commerce represents 1,400-member businesses in the Lakeland area and provides opportunities for networking, professional development and advocacy for companies of all sizes. Five-star accredited by the US Chamber of Commerce, the Chamber upholds the following vision and mission statements: Vision Statement - The Lakeland Chamber of Commerce will be the premier catalyst for the advancement of Lakeland’s economic growth and enhancement of quality of life– creating Florida’s community of choice. Mission Statement - The Lakeland Chamber of Commerce is the leading organization dedicated to creating a climate where business can prosper.